A classic candle glowing warmly, shedding its soft light on a lush arrangement on gorgeous flowers – what a feast for the eyes! Reminisce the old times and wish for the times to come with our exquisite bouquet “Candle Lit Romance”. Send your special person this blushing mix of red roses, red gerberas topped with some blue/purple static fresh flowers – simply presented with some seasonal fanned leaves and dry flowers delivered in an ornamental basket with a candle centerpiece – and they’ll know they mean the world to you. Whether it is your first anniversary or your fiftieth, birthdays or a romantic night out, celebrate your special bond to express your love & romance with our luminous arrangement of “Candle Lit Romance” bouquet. 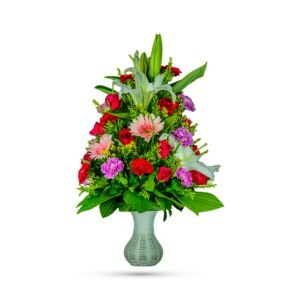 These freshly picked flowers enchanted with love and care will be hand-delivered at your doorstep. Our bouquets are always high quality, fresh, and affordable. Order online now and our quick delivery means you are never too late to send a great gift. May the luminous glow of our bouquet bring happiness and more love for the times to come. I would like to order this flower delivery on Monday 16th October 2017 at 9:00 am in below address cash on delivery . Please let me do confirm.